Garforth Academy is a secondary school, serving 1,950 students aged from eleven to sixteen. With the school expanding, a site-wide refurbishment was planned to coincide with the new academic year, including the full refurbishment of three existing areas of Academy, and a technology refresh for 26 classrooms. A key priority was finding an interactive screen technology that delivers high definition content, offers intuitive touchscreen capabilities, and needs minimal maintenance to lower the total cost of ownership. 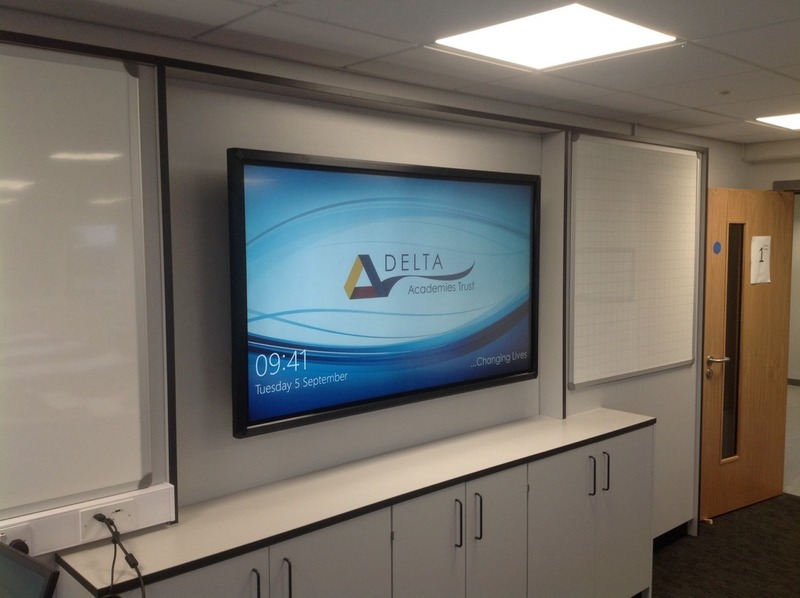 KPMS Commercial, a specialist in educational and corporate AV installation was tasked with delivering an interactive touchscreen to sit at front and centre of each classroom’s teaching wall. Garforth Academy was looking for an interactive solution to replace the existing projector technology used in its classrooms. With educational content increasingly including bright and colourful videos and graphics, the school required a high-quality commercial LCD screen with great viewing angles from all sides, and superb image performance from anywhere in the classroom. An anti-glare screen was also paramount to drastically reduce ambient reflection in high brightness environments without compromising sharp clarity of the content. KPMS invited Midwich, a leading trade-only distributor of commercial AV solutions, to present three different interactive touchscreens to members of the teaching and technology teams at the school. The teams selected the iiyama 65” ProLite, an Interactive LCD Touchscreen with integrated annotation software and USB playback. Self-calibration, accuracy of finger swipes and delivery of high definition content were key features that impressed the school’s team, alongside the integrated interactive EasiNote writing software allowing teachers to make annotations on files opened directly from a USB device or internal storage. KPMS turned to Midwich for its independent technical advice, range, availability of leading touchscreens and ability to provide post installation training. After an initial consultation, John Soden, from Midwich’s Interactive specialist team, identified touchscreens to suit the school’s requirements. John worked closely with KPMS to organise a day’s trial where three screens were set up at the school for staff to gain first-hand experience. Upon testing, the decision was clear and the school purchased 26 iiyama ProLite TH6567MIS-B1AG, interactive LCD touchscreens. KPMS worked with the building team to identify optimal screen location in the newly refurbished classrooms. As the touchscreens require a minimum amount of cabling, they were quickly installed on teaching walls over the period of a week. Ben Wetton, Associate Assistant Principal at Garforth Academy, commented on the project: “The ability to provide a side-by-side comparison of leading touchscreens was invaluable in our decision making. Our students conduct “touch screen lives”, and this experience of fast interactive content delivery needs to filter through to classrooms to encourage engagement. With the iiyama screens, we can present high-quality and dynamic content easily. Next PostDoes Your School or Business Require a Projector Upgrade?